Which Photo Booth Kiosk is Right for My Event? Now that you’ve decided you’re interested in renting a photo booth, one of the most important decisions is choosing which style photo booth kiosk will best fit your event. Three booth styles are commonly offered. 1) Curtain Style – The curtain style booth is the modern portable adaptation of the Traditional Booth. Rather than being a heavy wooden or steel or structure, the majority of the booth is made up of the curtain, and all parts are constructed to be portable and easily set-up or broken-down in under an hour. The curtain style booth started the photo booth event rental craze of the 2000’s. It maintains the privacy of the traditional style booth and allows guests to take a series of photos, often with fun props that bring reserved guests out of their shells. Since the majority of the curtain style booth’s structure is made of fabric it can usually hold up to 8 guests comfortably, but often your guests will have the most fun trying to see how many people they can cram in uncomfortably! The backdrop of the image is designated by the color of the curtain (usually black). The equipment used in a curtain style booth varies widely, but generally always features a camera, a button to start the photo process, and a printer. 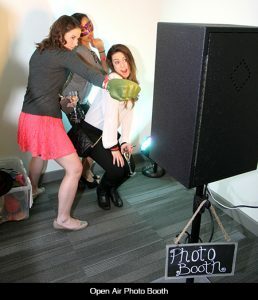 2) Open Air – The open air style booth is the newest photo booth style, and the least traditional of the three options. It generally consists of a photo booth structure pointed at a backdrop. The open air style borrows elements from a professional photographer’s studio and from a celebrity red carpet. Everything is contained in a smaller package than a curtain or traditional booth, while often still maintaining the full functionality of the larger styles. An open air style booth set up is the most adaptable of the three options. The set up can be condensed when space is a concern, configured for a full length vertical photo, or even set to take a wide angle shot of 15 guests. Because an open air style photo booth can be tailored to the look and feel of your event, it’s often the preferred choice of event planners. Your booth choice boils down to preference. Some people don’t feel they’re actually using a photo booth unless they go into a structure. Others would prefer to be the life of the party and have every guest see their antics. For others, the look and feel of the booth within the event space is the most important factor in selecting a booth style. To choose which style photo booth rental is best for your event you should consider the space available, whether you require standalone operation, the personality of your guests, and which style would best fit your décor. Ask to view current photos of the booth style you’ll receive before making your reservation. Tip: Be mindful that a curtain or open air style booth is generally best positioned against a wall, and all booths should be placed near a power outlet. Tip: Don’t automatically assume a company’s open air style booth is smaller than a curtain structure. Many companies have adapted their curtain style booth to also work as an open air, and have similar spatial requirements for both. Tip: Open air booth features can vary widely. Some booth operators have a minimal setup that consists of a camera on a tripod. Others have a fully functional offering with a touchscreen, live view and instant digital prints. As always, get details in contract form to make sure what you expect is what you’ll receive.